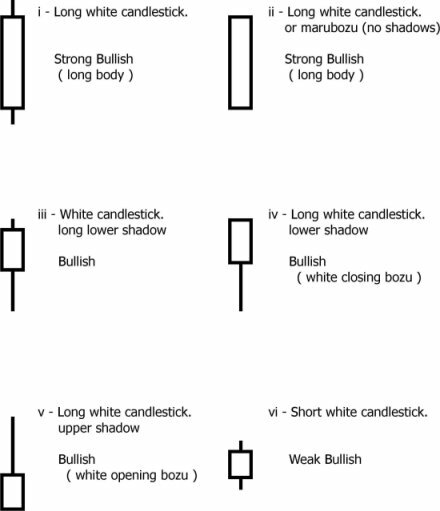 The easiest type of signal is the single white candlestick (yo-sen). 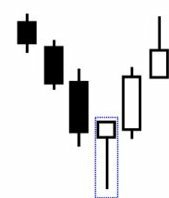 The longer the body (jittai) the more bullish is the candle. The Hammer, consists of a small body (either color) with a very long lower shadow. This pattern is typically found at the top or bottoms of trends. When the pattern occurs at the top of a up trend it is called a hangman (when it is found at the bottom of a down trend it is called a hammer). The hammer can be either a black or a white candle.